The first day of school is crucial and can set the tone for the rest of the school year. Fancy Pants - Get out your best clothes (you have probably ironed them already) and suit up! Your students need to know that you mean business. Put on a Happy Face - Don't let your students know if you've been stressing out about going back to school. Greet them first thing in the morning when your students arrive at school. Stand outside your door, shake their hand, look them in the eye, smile, and say, "Good morning, my name is _________ and I am SO EXCITED that you are in our class. Procedures, Procedures, Procedures - Model, Explain, and Practice classroom procedures. Check out the Classroom Procedures blog post for more information on setting up specific classroom procedures and rules. Eat with your students - Some of my most treasured times teaching were at the lunch table with my class! This is a great time to get to know your students, understand their interests, and be able to use their likes and dislikes when teaching lessons to make them more interesting to the kids. Try to stay away from negative teacher lounge chat. If you do choose to eat in the teachers lounge, try your best to be the positive light that shines with compliments, encouraging thoughts, and great things that your students are doing. 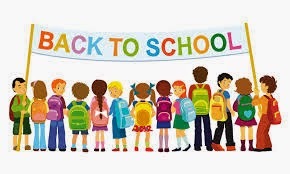 After school quiet time - Take about 10-20 minutes after the first day of school is over to think about what worked, what didn't work, what you did right, what you did wrong, and how you want to continue on the second day of school. The second day is even more important as you need to stick to your procedures and stay on top of your game! The First Days of School book by Harry Wong. Give Me Five Poster - A great way to get your student's attention. Raise your hand and say, "Give me five please." Student Information Sheets - Forms you will need to keep track of you students and their parents, as well as parent volunteer sign-up sheets. I really enjoyed this post. I love the poster and everything about it. I am going to be teaching 1st grade again this year, my second time and I am always looking for ways to improve my classroom management. This came just in time for me to get it ready for my class. Thank you so much.